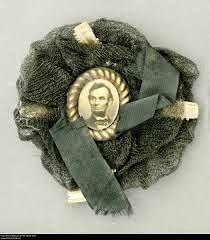 As regular Gossips readers know, this year marks the sesquicentennial of the assassination of Abraham Lincoln. 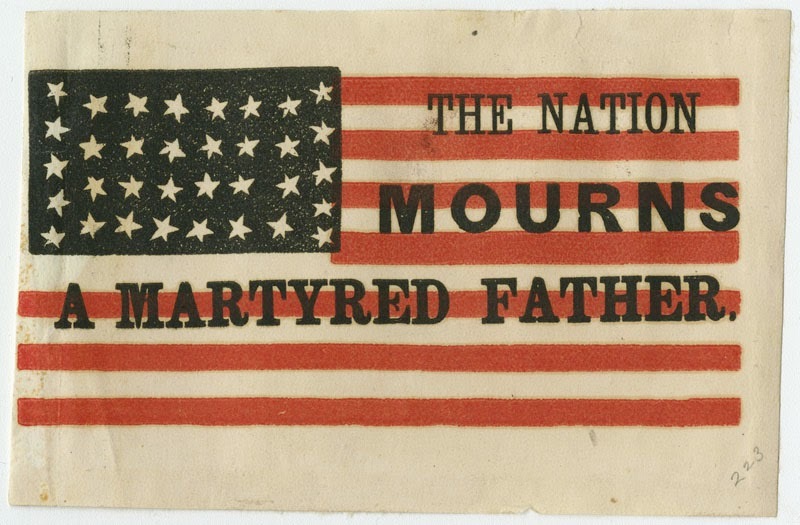 Happening less than two weeks after the fall of Richmond and less than a week after General Robert E. Lee's surrender, the first presidential assassination plunged the country into mourning and gloom, fear and desolation. At Hudson . . . elaborate preparations had been made. Beneath an arch hung with black and white drapery and evergreen wreaths, was a tableau representing a coffin resting upon a dais; a female figure in white, mourning over the coffin; a soldier standing at one end and a sailor at the other. While a band of young women dressed in white sang a dirge, two others in black entered the funeral-car, placed a floral device on the President’s coffin, then knelt for a moment of silence, and quietly withdrew. This whole scene was one of the most weird ever witnessed, its solemnity being intensified by the somber light of the torches at that dead hour of night. On Saturday, April 25, at the very time that the funeral train arrived in Hudson 150 years ago, the scene described by Townsend will be re-created. Playing a major role in the commemorative event is the "band of young women dressed in white." On Saturday, March 7, Mary Deyerle Hack, of Diamond Opera Theater, who will be rehearsing and conducting the choir of female voices, is holding auditions to find 35 female singers, to represent the 35 states in the Union in 1865, to make up the band. All those who are part of the band get to wear, for the re-creation, this fabulous costume, inspired by period engravings and designed by Stephanie Monseu of the Bindlestiff Family Cirkus. Gossips' post on Thursday about the risks of transporting crude oil by rail inspired Neal Van Deusen, a former chief of the Hudson Fire Department, to share this picture, taken last October in Catskill. Fire trucks and fire fighters from two Hudson companies--Hoysradt Hose & Chemical and Rogers Hose--are on the ground, assisting the Catskill Fire Department at a structure fire just off Route 9W, while a train of tanker cars passes overhead. 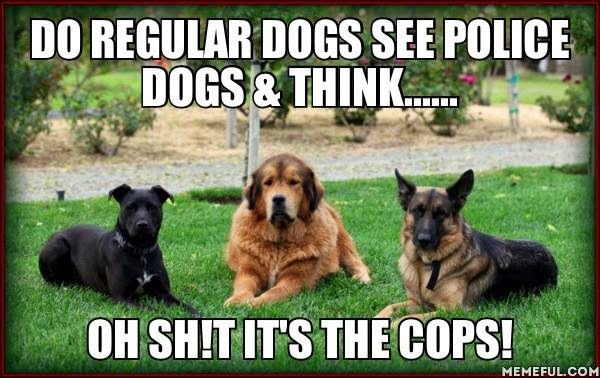 Gossips missed the Common Council Police Committee meeting last Monday and hence missed the news that a K9 unit is returning to the Hudson Police Department. Hudson used to have a K9 unit, but in 2006 the Common Council voted to remove the funds for it from the city budget. Among the reasons for this action at the time were: the K9 unit was causing costly scheduling problems for the HPD; the dogs were not being used, as was hoped, to prevent people from bringing drugs into the city by train (it was maintained that this could not be done because people had to put their bags down voluntarily for the dogs to sniff); the county sheriff and state police had K9 units that could be called in when and if they were needed. Nine years later, all the problems and constraints seem to have disappeared--at least, the cost of a K9 unit to the City has. The word is that the new K9 unit will be funded by the Richard & Terez Abatecola Foundation. 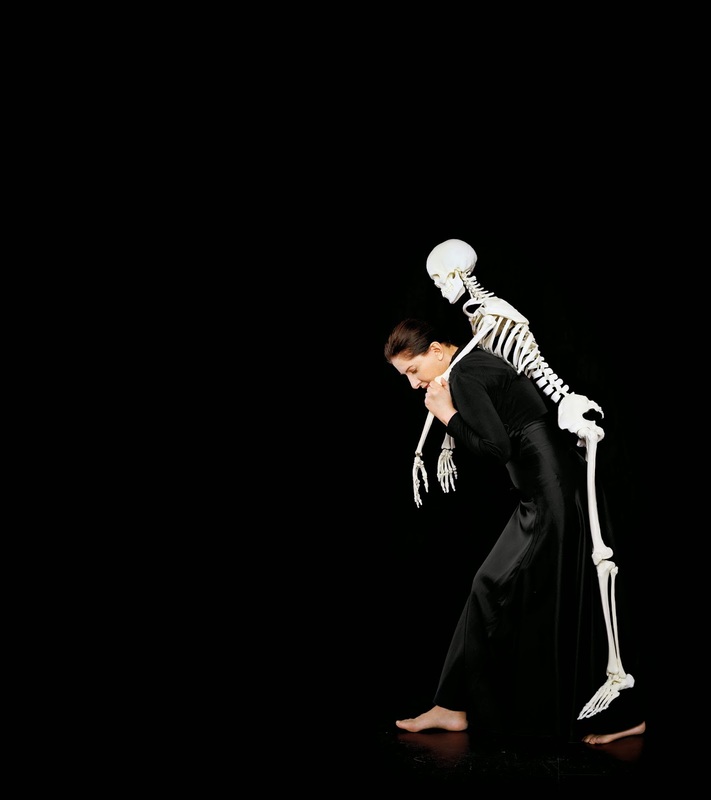 There's an article today in Bloomberg Business that summarizes Marina Abramovic's career and reviews her current situation vis a vis the Marina Abramovic Institute (MAI), which is hoped will someday open in the old Community Theater building at the corner of Columbia and Seventh streets: "The World's Most Famous Performance Artist Needs to Make Real Money." 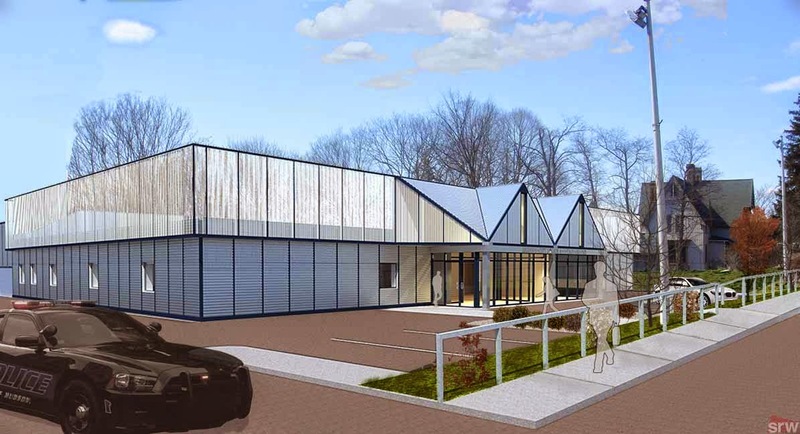 This morning at 10 a.m., the Historic Preservation Commission held a public hearing on the proposed design for 701 Union Street, the metal building constructed in 1977 to be an auto parts store which is now being transformed into the Hudson City Police and Court Center. Rick Rector, chair of the HPC, began the public hearing by explaining that the commission's concern was with the compatibility of the design and the materials with the surrounding neighborhood and reminded the commission members that their role in the public hearing was to "listen and learn." He made it clear that the public hearing would last no more than an hour, but it was over in far less time than that. Richard Franklin, the architect for the project, was on hand to present the plans to the HPC. He began by saying it had been "a fascinating project to be involved in." He spoke of the complexity that needed to be incorporated into the interior design and noted that the building sits below street level. The goal, he explained, was "to uplift it and give it some presence." The use of metal paneling made it easier to utilize the metal panel system of the existing building, and the metal "parapet" proposed was an inexpensive way to increase the building's height. Franklin said he had "always been interested in the way the roofs in the area were configured" and spoke of the proposed design as "contextualizing" the building into the existing neighborhood. Although, it had been reported that there were "many residents who are not happy with the exterior design of what this building will look like" and there were a fair number of people in attendance, only two people made comments, and both were positive. Sarah Sterling, supervisor for the First Ward, acknowledged "all the complexity of meshing the police and court" and congratulated everyone involved. She expressed the opinion that she liked the design and said the architect had done "a great job with what was there." Nicole Vidor echoed Sterling's comments, calling the design "an extremely handsome building." Had the public hearing gone on a bit longer, Gossips might have opined that the building was a textbook example of both adaptive reuse and compatibility of modernity with historic surroundings. When the public hearing was over, the HPC resumed its discussion of the building. Some members asked questions that seemed less than relevant to the review at hand. Peggy Polenberg wanted to know about lighting on the site and how people entered the building; David Voorhees wondered about snow on the roof. A germane comment was made by Miranda Barry, who lives in the neighborhood and confessed her personal interest in the building and its appearance. She commended Franklin for "making the effort to incorporate elements of existing architecture" into the design and called it a "really good job." The HPC then voted unanimously to give the design its blessing. On Wednesday, the Common Council Legal Committee voted unanimously (of those present) to move forward the plan to introduce resident parking permits in the area around Columbia Memorial Hospital. This was reported yesterday in the Register-Star: "Legal committee OKs bigger parking plan." Today, the Register-Star reports that the mayor has announced he will oppose the revisions made to the plan, originally his, by the Legal Committee: "Mayor, committee vie on parking plans." The mayor takes issue with the additional streets included in the plan by the Legal Committee, maintaining that these "were not part of the problem." According to the article, "Hallenbeck said the extended area covered by the plan 'causes a problem for the hospital, not to have any [on-street] parking for its employees.'" 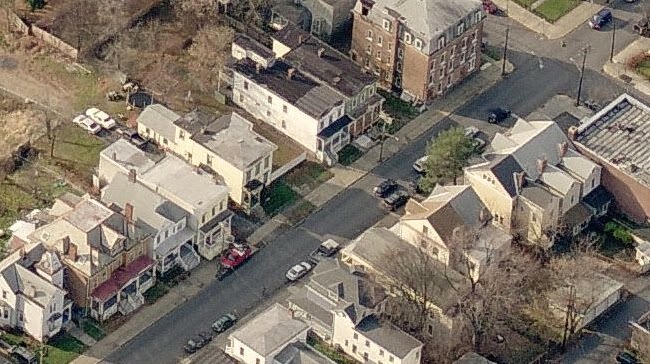 On Wednesday, Claudia DeStefano, who lives on McKinstry Place and has been closely monitoring the progress of this law, even though, as she regularly reminds the Legal Committee, it doesn't affect her because she has a driveway, observed that "the scope of the area is humongous from the original" and wanted to know why. Alderman John Friedman, who chairs the Legal Committee, explained, "Exporting a problem from one area to another doesn't solve the problem," and pointed out that the affected area now extends "two blocks in all directions" from the hospital. On Tuesday, Hudson made the evening news again--this time on CBS Channel 6. 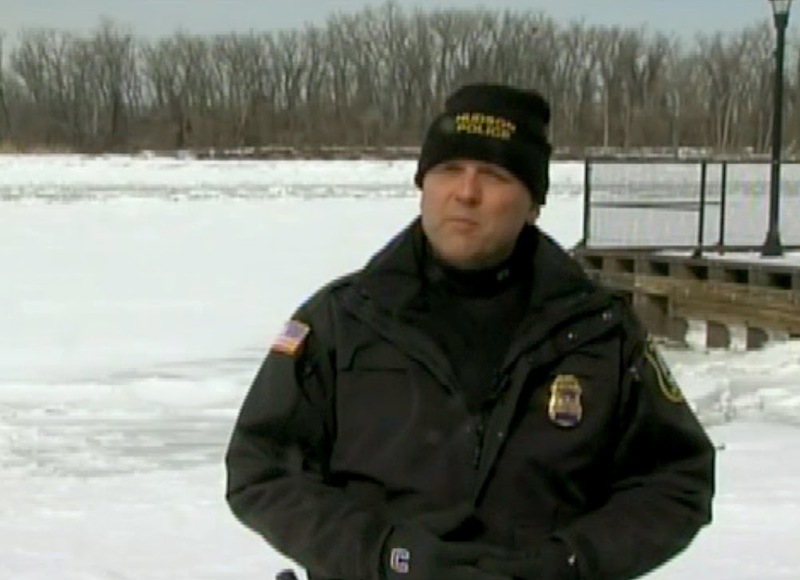 The story featured Chief Ed Moore of the Hudson Police Department, warning of the dangers of walking on the frozen Hudson River: "Stay off the ice!" Sad but true, although the ice on the Hudson River is reported to be 16 inches thick, there is no place in Hudson where the public can skate and probably will be none this winter. 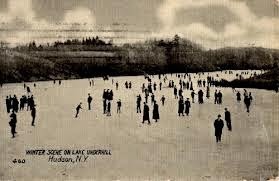 As reported last month, snow has not been cleared from the ice on Oakdale Lake to allow skating because the City's liability insurance does not cover ice skating on open water. At last night's Public Works Committee meeting, Gossips asked about the progress on Plan B: to turn the basketball court at Oakdale into a skating rink. Rob Perry, superintendent of Public Works, reported that the white tarp they had been waiting for had finally arrived, but by the time it did, the future rink was covered by several inches of snow and the Department of Public Works was fully engaged clearing snow from the streets of Hudson. When asked by Alderman Tiffany Garriga (Second Ward) about the ice at the sides of streets, separating the sidewalk from the roadway and presenting a treacherous barrier for pedestrians, Perry said there was nothing that could be done. "It will be there," said Perry, "until Nature takes it away." Last week, a train carrying 3 million gallons of crude oil--very likely one that had already traveled through the Hudson Valley--derailed in West Virginia. Nineteen tanker cars slammed into each other and caught fire. A nearby house burned. Hundreds of families had to be evacuated when they lost their water and electricity. And oil spilled into a tributary of the Kanawha River. Last night, Dave Davies, substituting this week for Terry Gross on NPR's Fresh Air, interviewed Marcus Stern, an investigative reporter who has spent the past year studying the risks of transporting crude oil by train throughout the country. If you missed the broadcast, you can listen to the interview online: "A Hard Look at the Risks of Transporting Oil on Rail Tanker Cars." Gossips reader Chloe Zerwick, whose comment on an article about ageism in our society appeared in the New York Times a few weeks ago, has now published a post on the topic on imby.com: "The ageism of dinner parties." In December, Gossips reported that the Common Council had passed a resolution "authorizing the mayor to 'execute all necessary documents to engage Saratoga Associates to implement the Redevelopment Analysis and Master Plan for a Multi-Use Waterfront Building.'" 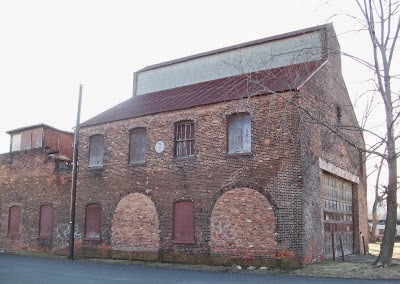 The building in question is one of the last surviving historic industrial structures on the waterfront: the Dunn building, originally part of the Hudson Coal Gasification Works. Gossips learned yesterday that the signed contract for the project had been returned to Saratoga Associates and work will begin any day now. The study is expected to take six months. Saratoga Associates has subcontracted with Jennifer Schwartz Berky to handle the planning aspect of the project. The little car is due for its annual servicing, and not wanting to drive all the way to the dealership in Latham with Joey, who suffers from severe separation anxiety, in the car and uncertain if he would be allowed to sit with me in the service department waiting room, I made an appointment at a local auto service shop that assured me they could service a SMART car and would welcome a dog. After the appointment had been scheduled, the man at the shop said, "So, we just need to change the oil, right?" Certain there was more involved, I decided to go online and check. I initiated my Google search by typing in "smart cat annual servicing" and was surprised at the results, the first being: "Taking Your Pet for a Vet Visit." 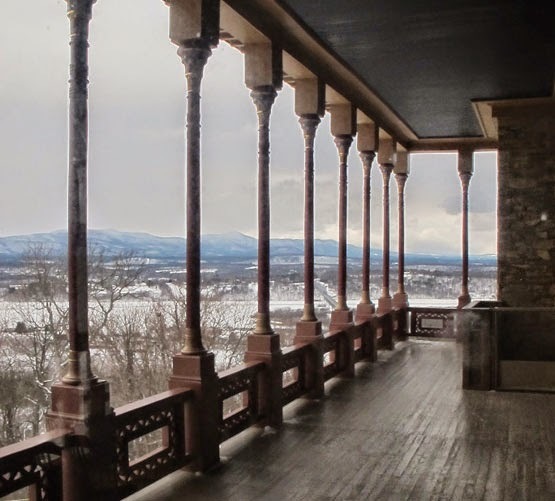 The blog New York Social Diary published today a brief account of Frederic Edwin Church's life and career and a more extensive tour of his home, Olana, with photographs historic and modern, written by John Foreman, author of the blog Big Old Houses: "Big Old Houses: Persia on the Mountaintop." Last night, the Hudson City School District Board of Education voted unanimously to approve a tax exemption for veterans in the 2015-2016 school year. The exemption provides a 15 percent reduction in school tax for veterans who served during wartime and an additional 10 percent for those who served in a combat zone. To be eligible, veterans must have served during the following periods: World War II, from December 7, 1941, to December 31, 1946; the Korean War, from June 27, 1950, to January 31, 1955; the Vietnam War, from February 28, 1961, to May 7, 1975; the Persian Gulf conflict, from August 2, 1990, to the present. Applications for veterans' exemptions must be filed with the assessor's office by Monday, March 2. 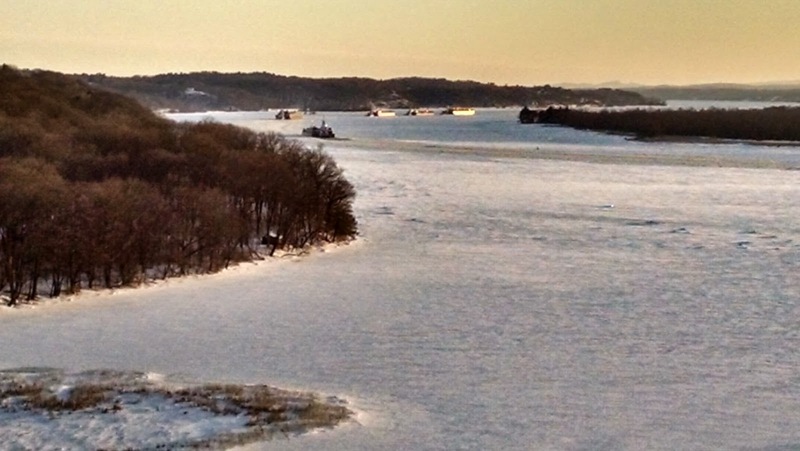 Yesterday, five barges heading south on the Hudson River got stuck in the ice near the Roe-Jan Creek Boat Club. This morning, the Coast Guard cutter Sturgeon Bay arrived to free them. At the end of January, the Register-Star announced the launch of a new program to "develop a pool of minority candidates that are able and willing to take advantage of openings for police officers": "Program looks to up police minority hiring." Last night, the Law Enforcement Diversification Initiative (LEDI), funded by the Galvan Foundation, held its first session. 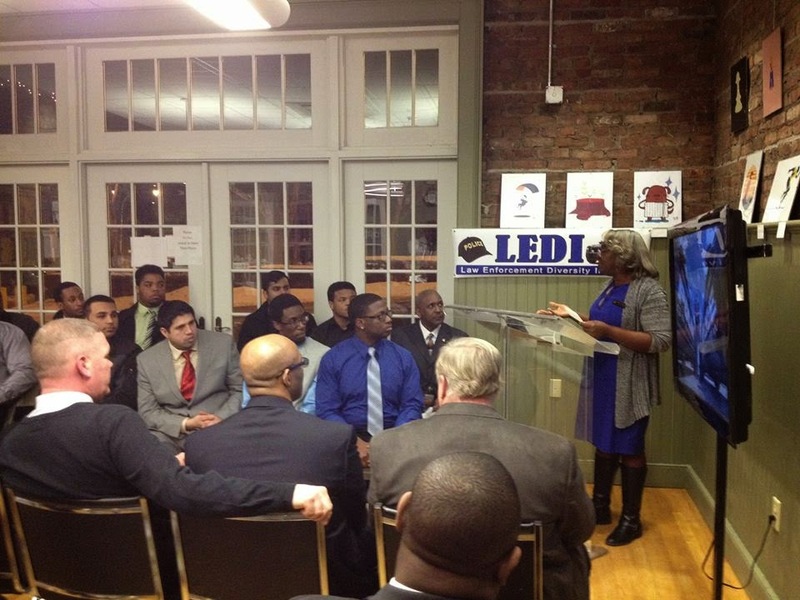 The event was covered by News Channel 13: "Initiative aims to add more minority cops." In the picture above, Donna Lewin, superintendent of the Hudson Correctional Facility, addresses the group. 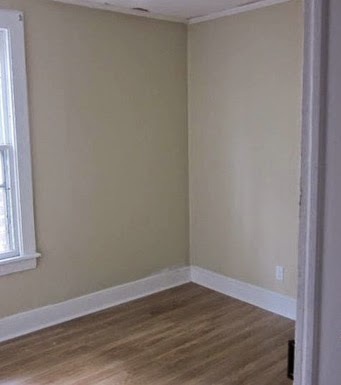 Last Tuesday, the City of Hudson Common Council adopted an amendment to the zoning law that would make 350 square feet the minimum size for an apartment. 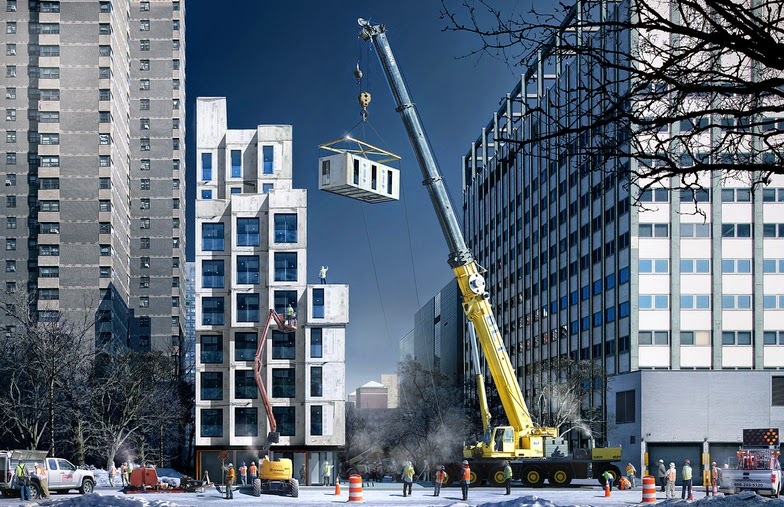 On Friday, an article appeared in the New York Times about a micro-apartment complex made of modular units being prefabricated at the Brooklyn Navy Yard to be assembled at 335 East 27th Street: "Home Shrunken Home." The apartments, which are leasing for $2,000 to $3,000 a month, range from 260 to 360 square feet. To permit this building to be constructed, the current New York City zoning and density requirement, which sets the minimum apartment size at 400 square feet, had to be waived. Last week, WAMC reported that Senator Charles Schumer had a plan to get the Town of Halfmoon, in Saratoga County, its own ZIP code: "A Town Without ZIP code." Halfmoon, which has 22,000 residents, is split betwen four different ZIP codes. If you live in Halfmoon, Schumer said last Wednesday at Halfmoon Town Hall, "You need to put your address as Clifton Park or Waterford or Mechanicville or Round Lake. The lack of a ZIP code has led to significant confusion, lost revenue, and it even affects emergency response." 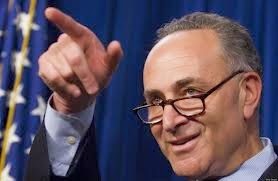 Maybe when Senator Schumer fixes Halfmoon's ZIP code problem, he will turn his attention to Hudson's ZIP code problem. Our problem is not that we don't have our own ZIP code, but that we have to share it with Greenport and parts of Livingston, Stockport, and Ghent. It's often the cause for embarrassment, as when a few years ago the man with the wacky scheme to build a device that would silently zap people with a deadly dose of radiation was identified in the media as being from Hudson. (He actually lived on Knitt Road, along the border between Stockport and Ghent.) And there are other problems as well. Statistics are often gathered and categorized by ZIP code, so it is difficult, if not impossible, to tease out what statistics apply only to the two square miles of Hudson. This is particularly problematic when it comes to sales tax. How much of the tax collected in the 12534 ZIP code is collected in the shops, restaurants, and B&Bs of Hudson and much is collected in the shopping malls and big boxes of Greenport? The reason always given for why Greenport cannot have its own ZIP code is that there is another Greenport in New York: the village of Greenport in Suffolk County on Long Island. Ironically, although Greenport on Long Island seems to have preempted Greenport in Columbia County when it comes to ZIP codes, the Village of Greenport was incorporated in 1838, one year after the Town of Greenport was formed in 1837. It doesn't seem as though the duplication of names should be an insurmountable problem, but divvying up the sales tax is a problem and one that will grow worse as Greenport continues to allow itself to develop as "the retail hub of Columbia County." It seems that when the temperatures drop down into the teens, the children at John L. Edwards Primary School are not sent outdoors to play during recess. That seems reasonable enough, but the activity provided as a substitute for outdoor play--crowding into a room to watch television--is a cause for concern among parents. It was the topic of discussion at the last school board meeting, as reported by Jeanette Wolfberg in the Columbia Paper: "Hudson asks: What's playing at recess . . . and why?" The HCSD Board of Education meets again tonight at 7 p.m. at Hudson High School, following a public hearing at 6 p.m. about school tax breaks for veterans. 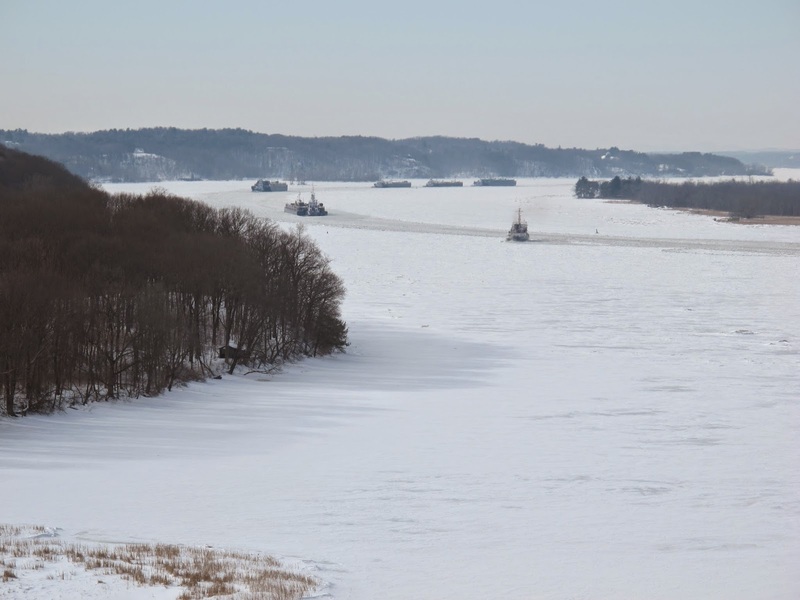 Three barges heading downriver, said to be empty fuel oil barges, got stuck in the ice today, right at Hudson's front door. The Gossips source who provided this picture reported that the tugboat pushing the lead barge would back up and repeatedly ram the ice pack. After about forty-five minutes of this, the barges started to move forward again. 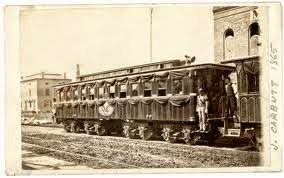 There is an article in today's Register-Star about the plans underway to commemorate the sesquicentennial of the events surrounding Abraham Lincoln's assassination on Good Friday in 1865: "Lincoln funeral train needs a helping financial hand." Since I am quoted in that article, I thought it would be useful to elaborate on the part of the commemoration with which I am directly involved: the re-creation of what happened in Hudson when the Lincoln funeral train stopped here on the night of April 25, 1865. 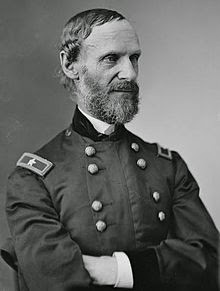 Edward Davis Townsend, then Assistant Adjutant General, was the commander of the funeral train that bore the coffin of Lincoln and that of his son Willie from Washington, D.C., to Springfield, Illinois, in the spring of 1865--a journey that began on April 21 and lasted until May 3. On April 25, 1865, the train arrived in Hudson at 9:45 p.m. Daylight Saving Time wasn't introduced until 1918, so 9:45 p.m. in 1865 translates to 8:45 p.m. in 2015, and on April 25 this year, at 8:45 p.m., the scene that Townsend called "one of the most weird ever witnessed" by be re-created down by the train station. Using Townsend's description, supplemented by other historic accounts, a team, which so far includes Jamison Teale, Windle Davis, Stephanie Monseu of Bindlestiff Family Cirkus, Mary Deyerle Hack of Diamond Opera Theater, and Melissa Auf der Maur of Basilica Hudson, is working to re-create what happened in Hudson when the funeral train stopped here. Very soon, auditions will be held for the "band of young women dressed in white" who will sing dirges of the period. Although Townsend doesn't tell the number of women who made up the band in Hudson, other sources indicate that such choruses were often made up of thirty-five young women, to represent the number of states in the newly restored Union. Hence, we are seeking thirty-five young women to make up our "band." 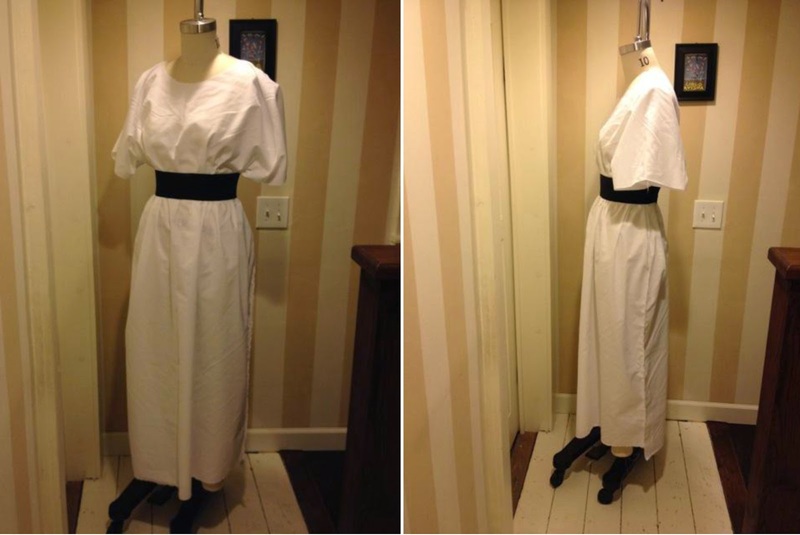 Monseu has designed a wonderful costume for the choristers, inspired by period images, so spread the word that female singers are sought. When it has been determined when and where the auditions will be held, it will be announced on Gossips and by fliers distributed around town. And save the date! Plan to be down by the station on April 25 (it's a Saturday) to witness history re-created. 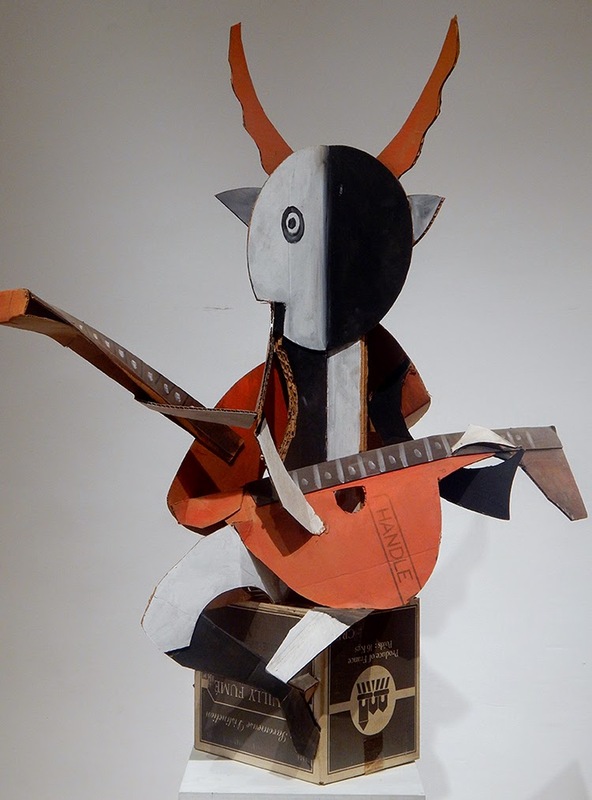 The Hudson Opera House has just announced that the opening reception for Caprices: The Sculptures of Bruno Pasquier-Desvignes, curated by R. O. Blechman, which was to take place tonight from 5 to 7 p.m. has been rescheduled for March 7. At the end of last year, many breathed a sigh of relief when the City was not awarded a grant to embark on an extensive "re-imagining" of the Public Square, a.k.a. Seventh Street Park. This year, the City is planning to apply, in the same Consolidated Funding Application (CFA) process, for funds to improve Promenade Hill. 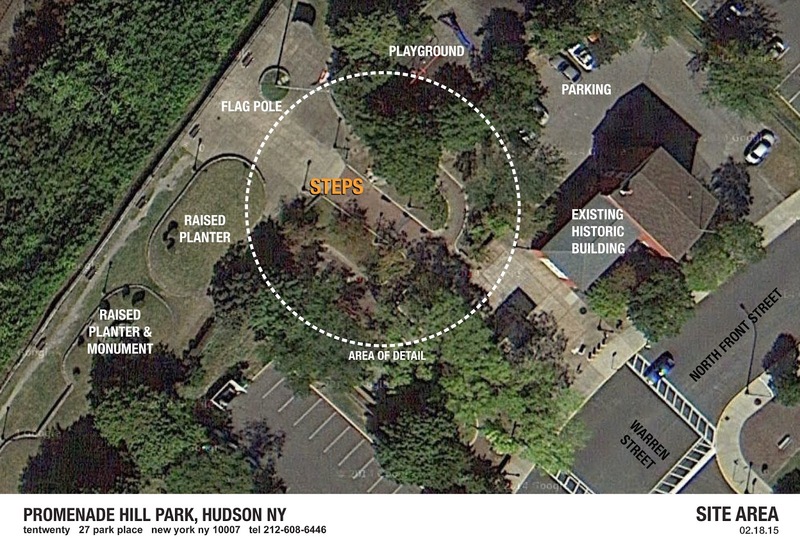 This time, dealing with a park that is recognized as being of historic significance on the national, state, and local levels, the plan being considered is more respectful and modest, focusing primarily on the entrance to the park and the need to provide access for the handicapped to the vistas on Promenade Hill. 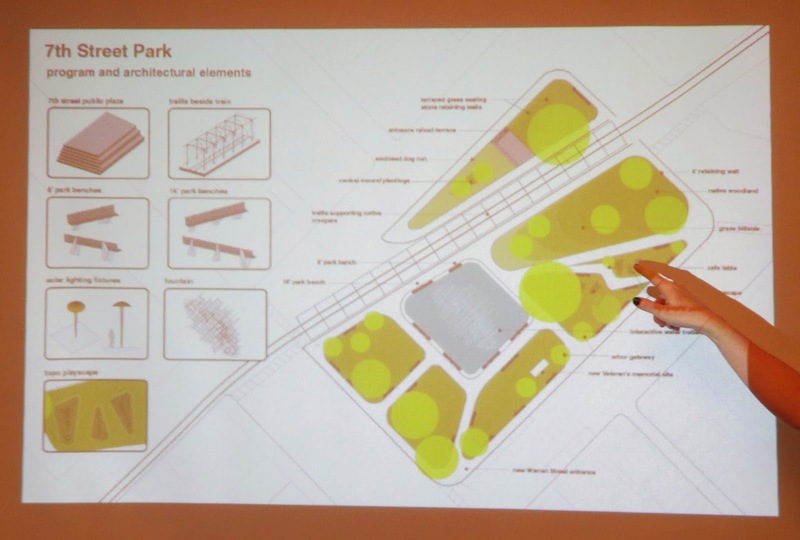 On Thursday night, at the Common Council Economic Development Committee meeting, Gossips got a look at the possibilities now being considered, which have been developed by architect and landscape designer Dragana Zoric. Council president Don Moore, who chairs the Economic Development Committee, asked how much was being requested in the grant application and what improvements it would fund. Bill Roehr, of TGW Consultants, said that the amount was $250,000 and it would fund "the ramp issue and pretty substantial improvements to the park," primarily new plantings. Moore also wanted to know if there was a significant difference in cost between the two options--Option 1 integrating a ramp into new stairs and Option 2 introducing a ramp and retaining walls to the left of the existing stairs. Roehr didn't answer the question specifically but assured Moore that Zoric was "exceptionally good with costs." 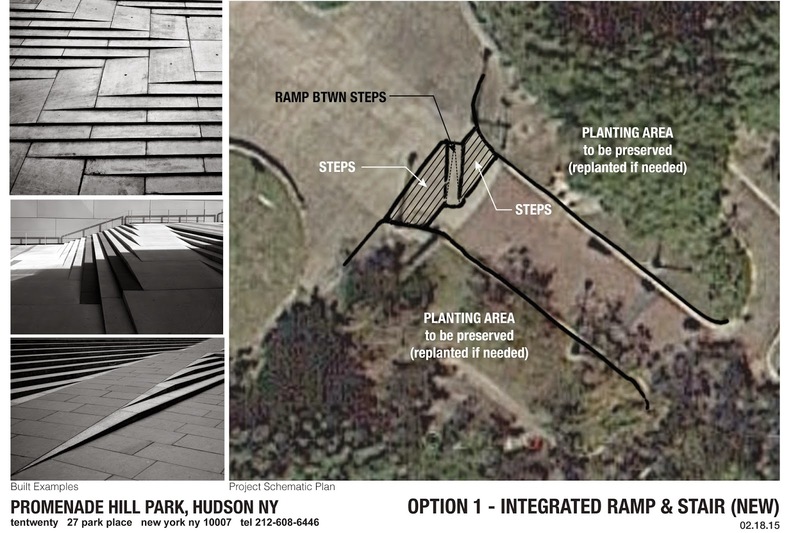 Those present at the meeting showed a preference for Option 1, which integrates a ramp into newly designed stairs to the park. Given the two options, Sheena Salvino, executive director of the Hudson Development Corporation, urged, "Let's go for something more beautiful." Moore requested that there be "open discussion about the character of the replanting" on Promenade Hill. The grant application is due in June. 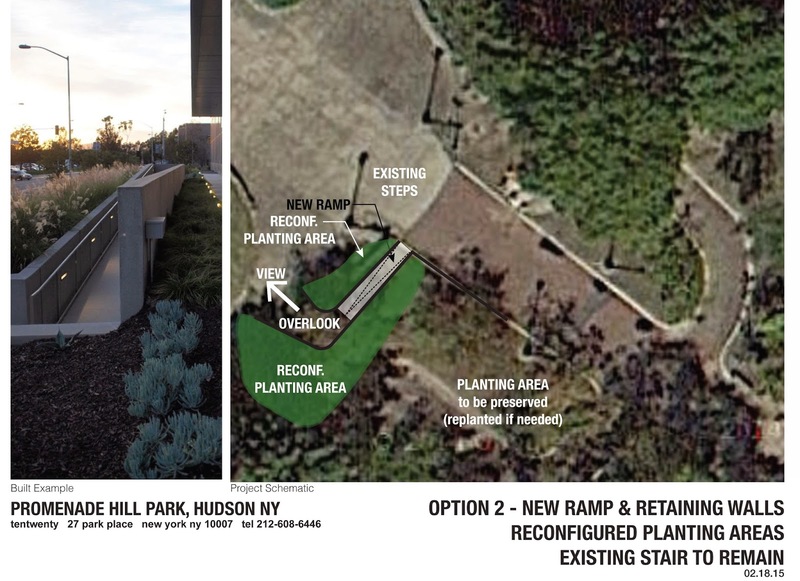 If the grant is not successful, the City is committed to spending $20,000 to install a temporary ramp at Promenade Hill. This afternoon, the Diamond Opera Theater was to inaugurate a new concert series called Voices at Christ Church. The concert, the first of four in the 2015 series, to benefit Diamond Opera Theater and the Hudson Opera House, is called Wanderlust: An Evening of Adventurous Music, and features mezzo soprano Mary Deyerle Hack and baritone Martin Mansfield, accompanied by pianist Noah Palmer, performing works by Ravel, Debussy, Brahms, Mahler, Leigh, and Sondheim. Alas, to the disappointment of all, snow, followed by freezing rain, has been predicted to begin at the mid-afternoon today, and it was reluctantly decided that it would be wise to postpone the concert. A new date for the concert has not yet been announced. 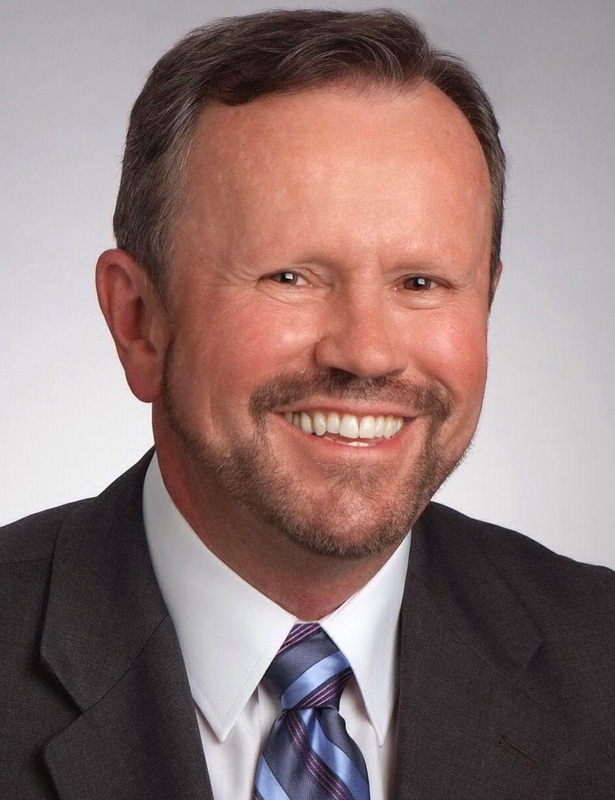 Gossips has just learned that Brian Howard, former superintendent of the Troy City School District who is familiar to us all as the Democratic candidate for state senator in the 43rd District in 2014, has died. Last night, News10 reported that Howard had suffered a major head trauma and was in the ICU at Albany Medical Center after he had apparently fallen while trying to clear snow from the roof of his house. He died from his injuries this afternoon. A Bad Day to Get Spotted in Hudson . . .
if you're wanted for something. Today, on Gossips' normally quiet block, a police car with siren wailing streaked by, heading east. When a second police car screamed past, heading in the same direction, and more sirens could be heard close at hand, I decided to investigate. From my stoop, I saw three or four police vehicles converged at the corner of Allen and Second streets. Then a plain clothes officer, his ID dangling from his neck, ran past, also heading east. Realizing that he was heading around to get behind the row of houses, I went to the back of my house, in time to see him stop in the alley just short of my backyard and to hear him say, "OK, you got 'em." Back on my stoop, I saw yet another police vehicle arriving and noticed that Chief Moore and Commissioner Graziano were on the scene. It was then that I saw a man reluctantly being escorted to a police car and put inside. Who was this miscreant on my block, and what was his offense? I still don't know what the man was suspected of doing, but I do know why there was such an incredible show of force. It seems the man, who was wanted for something, was spotted driving in Hudson by an HPD detective, who pursued him onto Tanners Lane. There the suspect ditched his car and fled on foot, heading up the Second Street stairs. The detective called for assistance, and by coincidence, at that very moment, twenty officers from the Hudson Police Department, the Columbia County Sheriff's Department, and the Greene County Sheriff's Department, who had spent the morning training at the Hudson Police Department's firing range on Newman Road, were heading back to the police station on Warren Street. They all responded. When the suspect got to the top of the stairs, he encountered two DPW workers with shovels working to clear a storm drain and the sound of sirens everywhere. He ran through a passageway between two houses into a fenced backyard (no way out except the way he had come in), where he was wrestled to the ground by several officers who at that point had arrived at the scene. When the excitement was over, Chief Moore commented: "Quite a scene--but not a murderer or a terrorist." A reader brought an article to Gossips' attention, which appeared in the Berkshire Eagle back in December: "Construction set to begin on bridge over CSX tracks at PEDA site." The bridge in question is in Pittsfield, Massachusetts (PEDA stands for Pittsfield Economic Development Authority), and the $4 million cost of the new bridge is being funded by the Massachusetts Department of Transportation. This, of course, calls to mind our own predicament with the Ferry Street Bridge, and the City's efforts to find the money to repair or replace it. Besides being in another state, there are some differences between the bridge in Pittsfield and our Ferry Street Bridge. 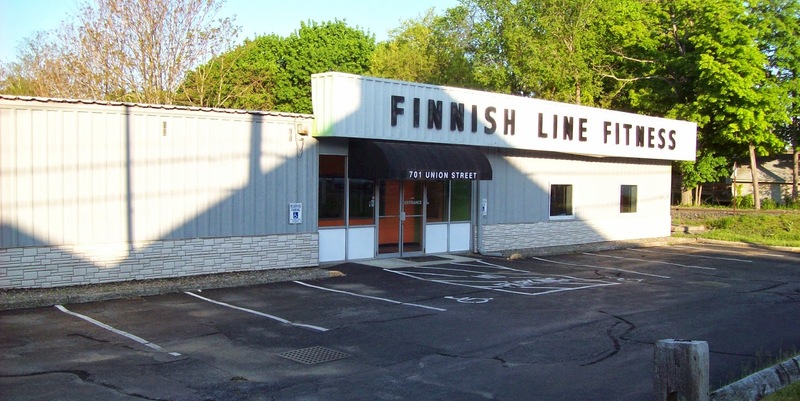 First, the bridge in Pittsfield carries a street that goes through a business park and is seen to be "crucial to attracting tenants to the site of General Electric's former power transformer facility." But wait. Tourism is finally getting recognition as a major element in Hudson's economy, and the Ferry Street Bridge to crucial to development of the Dunn building and the land east of Water Street. 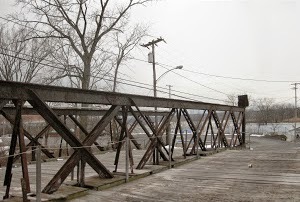 Then too, the bridge to be built in Pittsfield replaces one that was taken down in July 2012. Do things have to get worse before they can get better? 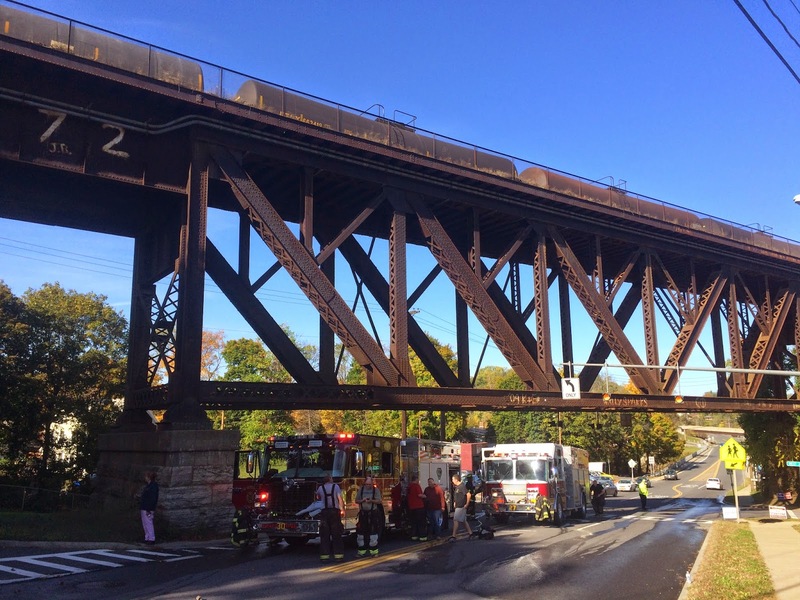 The article in the Berkshire Eagle explains that the bridge in Pittsfield "is one of 31 CSX bridges across the state that the DOT is fixing so that the rail company can run double stack rail cars from its base in Selkirk, N.Y. to Worcester." Since the tracks on our side of the Hudson River are now leased to Amtrak, it would seem unlikely that CSX is planning to run double stack rail cars on the tracks that separate Hudson from its waterfront, so, thankfully perhaps, there goes that reason to fix the bridge. The account in the Register-Star of Columbia County district attorney Paul Czajka's alleged misstep: "Supreme court to revisit Czajka-Dellehunt suit"; and the account that appeared in the Times Union: "Altered papers served by DA." Gossips learned this afternoon--as did everyone listening to the Thursday Afternoon Show on WGXC around 5 o'clock--that Tom DePietro has been appointed to the Planning Board, to fill the vacancy left when Don Tillson resigned last week. It is not known who will succeed Don Tillson as chair of the Planning Board. Who chairs the Planning Board is determined by the mayor. 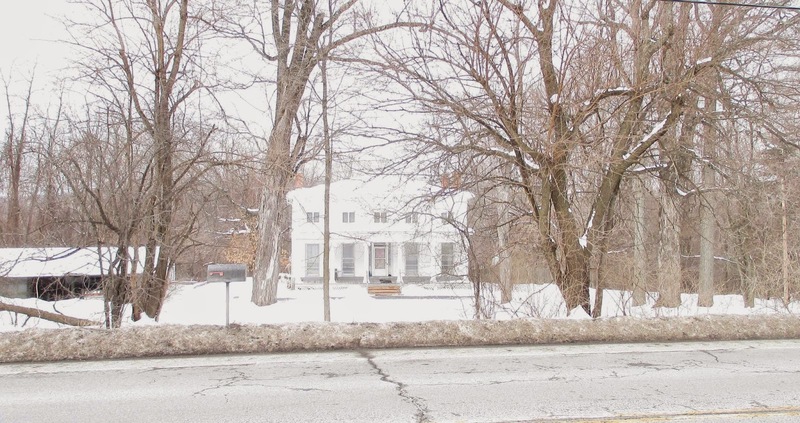 Last night's meeting of the Zoning Board of Appeals provided news of a new single-family house to be built on Rossman Avenue. The plans for the house, which will be located at 11 Rossman Avenue, came before the ZBA for an area variance. Because the house will be set into the hill, part of the living space will be partially underground. The building code requires egress windows for that space. Those windows will swing out, requiring window wells that will take up four feet of the required ten-foot side setback. Hence, an area variance is required. At last night's meeting, the ZBA accepted the application and scheduled a public hearing on the project for March 18 at 6:15 p.m. Because Rossman Avenue is part of a locally designated historic district, the design for the house must be reviewed by the Historic Preservation Commission. It is expected that the plan will be presented to the HPC in April. The ZBA scheduled a second public hearing for March 18. That public hearing involves a lot line adjustment to allow the owners of 515 Union Street and 517 Union Street each to have a driveway and off-street parking. That public hearing will begin at 6 p.m., immediately preceding the public hearing about the new house on Rossman Avenue. There is a vacancy on the Zoning Board of Appeals and has been since Phil Abitabile, who moved to Greenport, resigned in the middle of last year. Anyone interested in serving on the ZBA might want to contact the mayor and make that interest known to him. Members of the Common Council want to establish a capital reserve fund and initiate a lodging tax. The mayor brags that the fund balance has grown during his administration and congratulates himself for holding the line on taxes. Property owners grouse about the increasingly heavy burden of property taxes, much of which is represented by school taxes. Where's the truth? Is the City of Hudson comfortably solvent, or does it need new sources of revenue? John Mason spoke with Heather Campbell, the city treasurer, who should understand the city's financial state better than anyone, and reports what she had to say in today's Register-Star: "Treasurer: City needs to plan for big ticket items." At the Common Council Legal Committee meeting in January, Timothy O'Connor offered to make himself available "to explain why the City is flirting with a lawsuit" over its sewer separation plan. Apparently, no one has taken him up on the offer, so O'Connor is trying a different strategy: articulating with painstaking completeness, in writing, the problems with the plan. Last night, the Common Council received as a communication the introduction to a document O'Connor is calling "Preview of a Potential Article 78 Challenge Pending SEQR Classification of the City of Hudson's Front Street Sewer Separation Project." O'Connor's scrutiny was prompted by the City's success in getting a Community Development Block Grant (CDBG) for the project at North Front and State streets, which would separate storm water from the sanitary sewer and direct the storm water, untreated, into North Bay. He states in his introduction: "For the public, it is inexplicable that in December 2014 the New York State Office of Community Renewal saw fit to award the City the maximum grant of $600,000 for its ill-advised sewer separation project. This was done in apparent disregard for the detailed objections of Public Comments which were submitted with the grant application." In the application, it was stated that the City "anticipated that the project will be classified as Type II" for State Environmental Quality Review (SEQR). Under SEQR, an action classified as Type II is exempt from further environmental review. O'Connor asserts that the basis for the project's Type II SEQR status is suspect. Back in 2007, the City was cited for a violation of New York State's Environmental Conservation Law. The principal infraction was a chemical spill from Hudson Fabrics, which at that time occupied the building at the north end of Second Street. 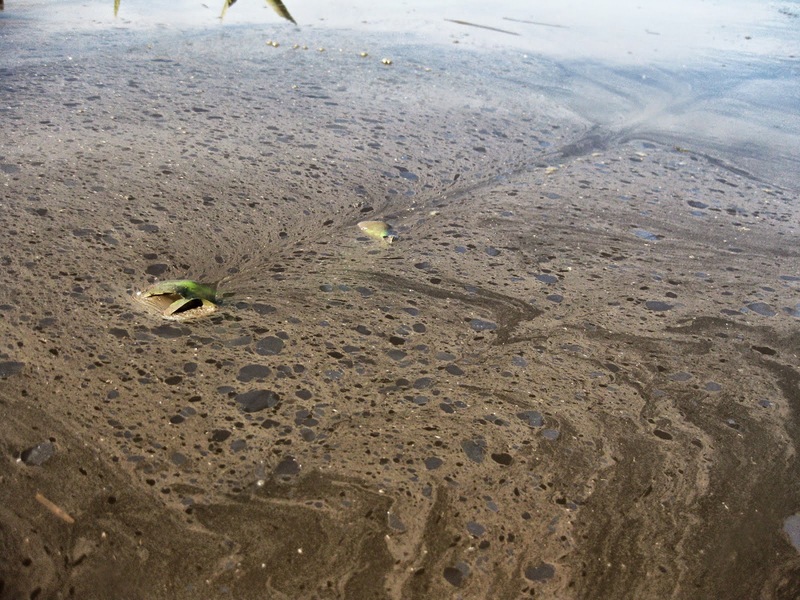 As a consequence of this violation, the City has, since that time, been under a Consent Order to comply with state and federal clean water policies. It is this Consent Order that is the basis for the project's Type II SEQR status. The City is taking the position that, because the action proposed relates to the Consent Order, it is a Type II action and exempt from further environmental review. O'Connor takes issue with this and explains in his introduction: "When a Consent Order is explicit with regard to an activity it has ordered, then unquestionably the action is exempt for SEQR review. In the City's case, however, the Consent Order was not explicit as to the methods of implementing the order, meaning that subsequent decisions or actions of a discretionary nature are not immune to SEQR review." The entire document submitted to the Common Council, which is only the first part of a much larger paper, can be read here. The photograph that accompanies this post, taken in North Bay last June, is from O'Connor's blog, Hudson Meets Hudson, a.k.a. Hudson Conservation on the Hudson. Last night, two aldermen were absent for a critical vote at the regular monthly meeting of the Common Council. In the Register-Star, it was explained that both were “away on family business.” Gossips has learned the nature of that business. Alderman John Friedman (Third Ward) was with his wife in Missouri, where his father-in-law was dying. Alderman Bart Delaney (Fifth Ward) was out for dinner with his wife, celebrating his birthday. Last week, the New York Times published an article about a new study of the impact of smoking on health: "Smoking's Toll on Health Is Even Worse Than Previously Thought, a Study Finds." Today, the Register-Star reports that the cigarette superstore in Fairview Plaza wants to build a bigger building: "Smokers Choice looks to expand." Doug Nolan, president of Smokers Choice (it's a chain with fifty-four stores), assured the Greenport Planning Board that the new building would have a drive-thru, as the current building does. In the article, he is quoted as saying, "It's convenient. A mother doesn't have to drag her kids inside." In the half hour before the Common Council meeting this evening, there was a piece on NPR's Marketplace about the historically low vacancy rates for apartments in cities around the country: "Landlords have the upper hand in many rental markets." One of the people interviewed was the landlord of a building in St. Paul, Minnesota--a building "with handsome wood paneling, high ceilings . . . in a high-end neighborhood." The building had 57 studio apartments; the size of each apartment was about 225 square feet. Half an hour later, the last thing the Common Council did at its meeting tonight was to vote, unanimously, to remove Local Law No. 9 of 2014 from their desks, thus making 350 square feet the minimum size for any apartment--studio or one-bedroom--in Hudson. As we know, the resolution that would have enabled the Common Council to retain a legal adviser was vetoed by the mayor. At the informal Council meeting on February 10, the mayor's veto message was received by the Council, and the aldermen were to vote on the resolution again tonight. A two-thirds majority would have overridden the mayor's veto, but alas, two aldermen were absent: John Friedman (Third Ward) and Bart Delaney (Fifth Ward). Perhaps fearing that a two-thirds majority could not be achieved without the votes of Friedman and Delaney, Council president Don Moore wanted to postpone the vote, explaining that the issue was one that was very important to the two absent aldermen. City attorney Carl Whitbeck, however, asserted that, according to the charter, a vote to override a mayoral veto must take place at the Council's next regular meeting. No vote was taken, and the mayor's veto stands. The Council shall have no legal adviser. 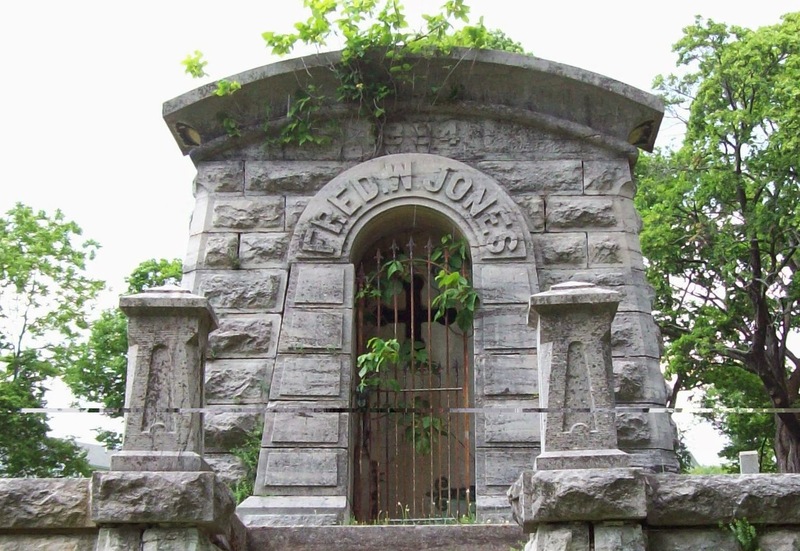 Of the 19th-century characters who shaped the Hudson of today--for better or for worse--Fred W. Jones is one of the most intriguing, if only because he died in bankruptcy and his remains were evicted when his grand mausoleum in the Hudson City Cemetery was foreclosed on. It was Fred W. Jones, owner of the New York Coral and Shell Marble Company, who bullied the City of Hudson into allowing him to build a railroad through South Bay, bisecting it from west to east, to carry stone from his quarries on Becraft Mountain to the waterfront. Known as "Jones's mountain railroad," it was begun in May 1874 but not completed until March 1889, and it proved to be the death knell for South Bay. The path of Jones's railroad is now the controversial "causeway." Gossips recently discovered another scheme promoted by Fred W. Jones for his own advantage, which could have had a long-term and not particularly desirable impact on Hudson. It seems that in 1889, there was talk of building a new state prison to replace the State Prison at Sing Sing, which had opened in 1826 and by 1889 was considered "ancient and dilapidated." 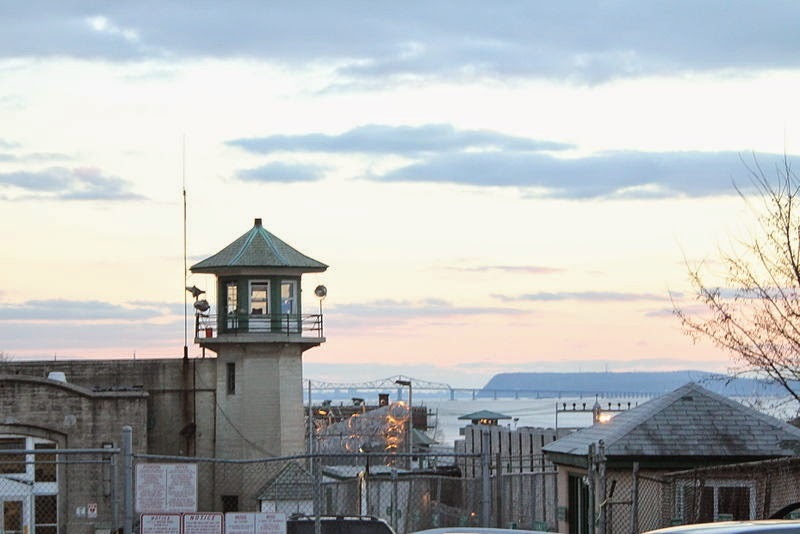 The civic leaders of Columbia County and the City of Hudson, along with Fred W. Jones on whose land the new prison would be located, were eager to have the institution built in Greenport, just beyond the border with Hudson. Penal institutions seemed to be desirable undertakings at the time. The Women's House of Refuge had opened in Hudson only two years earlier, in 1887. The following article, reporting on the progress of luring the new state prison to "greater Hudson," appeared in the Hudson Daily Evening Register for December 27, 1889.
with the Location of Jonesburg. Yesterday afternoon the Commission appointed to locate a new State Prison to take the place of the ancient and dilapidated institution at Sing Sing, gave a final hearing to all applicants at the rooms of the Assembly Ways and Means Committee in the Capitol. The City of Hudson was represented through the Board of Trade by Mayor Gregg, Wm. H. Traver and M. Parker Williams; and the County of Columbia through the Board of Supervisors, by Fred W. Jones, of Greenport, President of Jonesburg, and proprietor of the lands offered to the State for the prison site. The Committee was cordially received and was granted the precedence of a hearing, although a dozen other localities were ably represented and awaiting a hearing. Mr. Jones submitted, through Mayor Gregg, a written statement to the effect that of the lands which a majority of the commission had visited and inspected, the State could purchase at a very low figure (stipulating the sum) all the land they require for the purpose of a Prison, from one hundred to one thousand acres, including an inexhaustible stone quarry, which could furnish employment for any number of prisoners for all time; farming and grazing lands and wood lots. It was further shown by the Committee that there was on the lands proposed to be sold sufficient material that could be used in the construction of Prison buildings to more than reimburse the State for the money asked for the entire purchase. This material consists of stone in the quarries already opened and in operation; in the best quality of clay of which to make brick; of lime stone of which to make lime; of wood in abundance to burn the brick and the lime; of sand and gravel to construct roadways and for other purposes; broad acres under high cultivation which would raise all the grain, vegetables, and other products required for Prison consumption; with a railroad already constructed and in operation, by which passengers, prisoners and supplies can be conveyed direct from the Hudson River, Boston & Albany, and Harlem Railroads without change of cars. 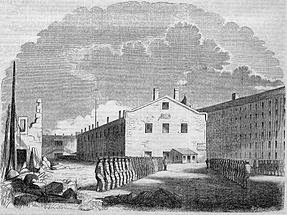 If a more eligible location for a mammoth Prison, such as the State of New York proposes to erect, can be discovered within the limits of the State, we have yet to learn where it is, and we don't believe the Commission, with all its alertness and vigorous prosecution of its arduous duties, has discovered it. The Prison at Sing Sing was erected over seventy years ago, when that locality was a "howling wilderness." The buildings are now dilapidated and a prosperous city has grown up around it. That city no longer wants the Prison, and the institution is out of place there. It is understood that the State proposes to erect a model Prison, with the most modern improvements that have been introduced in this country or Europe in penal institutions. It is further understood that such an institution will cost not less than two million dollars. The requisites necessary are ample lands, convenient location, work for convicts that will not intrude on established industries, and isolation from a populous community. Jonesburg, two miles from Hudson, meets all these requirements, and the title of "Jonesburg Prison" will not injure the fair fame of Hudson which it has held for more than a century. Gossips does not know what happened with the plan to replace Sing Sing. At some point along the line, it must have been abandoned. The penal institution once known simply as Sing Sing is now the Sing Sing Correctional Facility, and Jonesburg Prison was never built. More than ninety years would pass before Hudson got its own prison, the Hudson Correctional Facility, established in 1974 utilizing the buildings originally constructed to be the Women's House of Refuge. Female Empowerment or a Really Small Car? 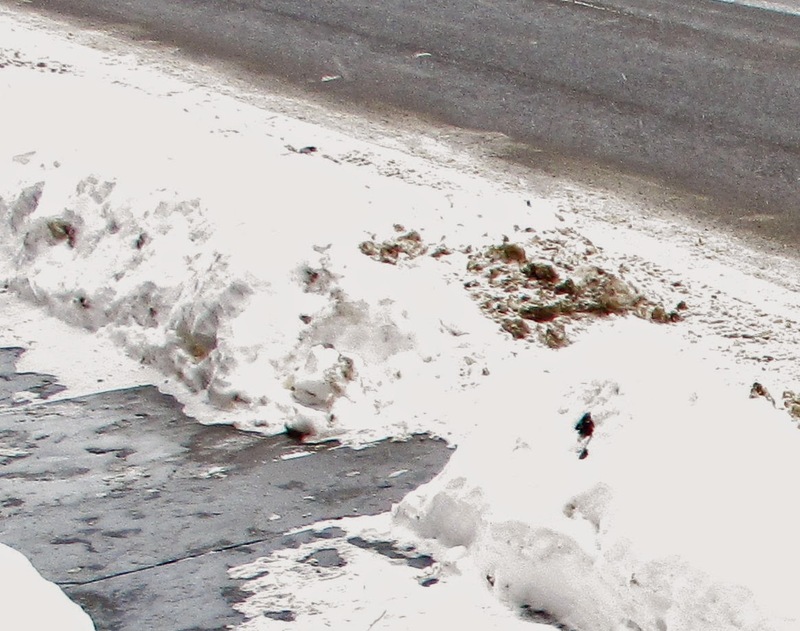 I got my little car stuck on Warren Street yesterday, several days after, according to the City's snow removal schedule, all snow should have been gone from both sides of the street. If I'd had a little room to back up and go forward, things might have been different, but it was a long holiday weekend, and parking was in great demand. The little car was sandwiched quite tightly between two larger cars. 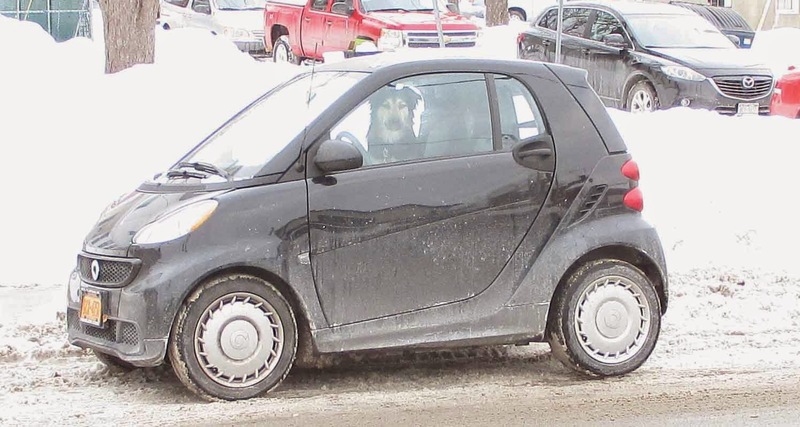 My maneuvers managed, unintentionally but fortuitously, to get the little car to pivot on the hardened snow so that it was pointed toward the street, almost perpendicular to the curb, but the rear wheels could get no traction. I was stuck. At that moment, a young woman walking along the street noticed my predicament, stepped over the residual snowbank, and gestured to her companion (also female) to join her. They got behind the little car and together gave it the push needed to get it out of the rut and onto the street. Circumstances didn't permit any more than a wave of thanks to these gallant young women as I moved off, but my gratitude for their kindness is abundant. Inspired by yesterday's post about Jonesburg, Peter Cipkowski sent Gossips this photograph from his grandfather's photo album. 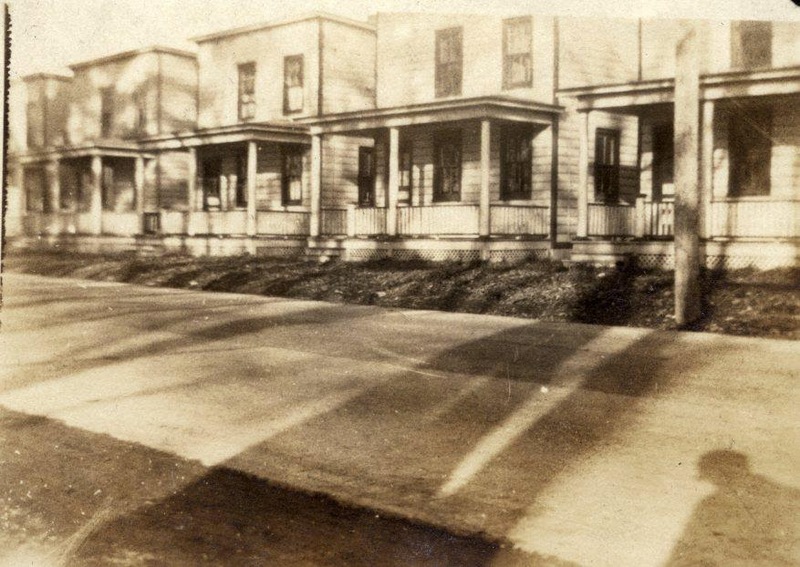 The photo of the row houses is dated 1926. In 1872, Fred W. Jones formed a company to quarry stone and marble from Becraft Mountain. The company was called the New York Coral and Shell Marble Company. 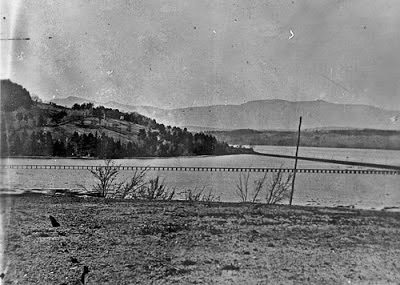 Between then and his death in 1901, in addition to building his "mountain railroad" through South Bay, which evolved into what is known today as the "causeway," Jones created a community known as Jonesburg. The principal elements of Jonesburg seem to have been his own house, originally the Peter Van Deusen homestead, on the west side of Route 9 just beyond Ten Broeck Lane, and the row of houses he built for his workers directly across the road. 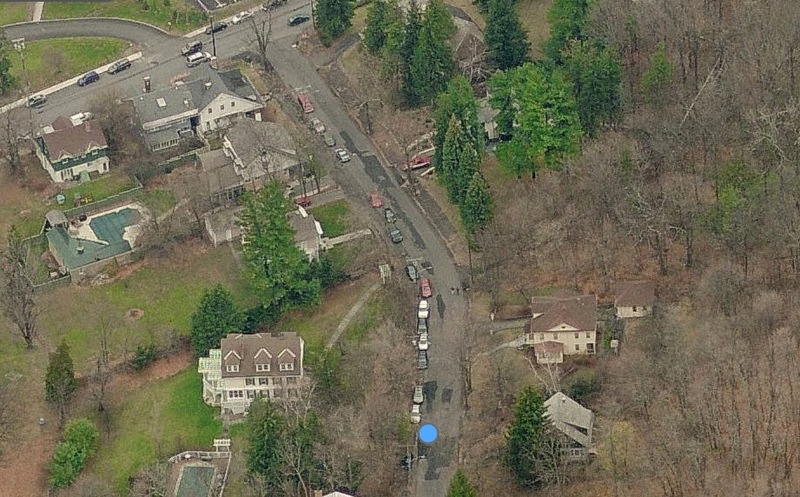 Recently, Gossips was alerted to the fact that the entire row of houses along the east side of Route 9 was vacant and each house had a notice posted on the door. The situation prompted the question: Were these examples of 19th-century worker housing to be renovated or demolished? Last week, Gossips journeyed out to Jonesburg to investigate and discovered that the notice posted on each of the doors was a building permit. It would appear that all the houses are going to be renovated. Correction: Gossips was wrong about these houses. They were not built by Fred W. Jones for his employees, nor were they built in the 19th century. They were built by the Ten Broecks, probably in the early 20th century, after Jones, who died in 1901, was already dead. At one time the stand of houses was known as Ten Broeck Row. Poet, writer, and retired newspaper photographer, reporter, and editor, Djelloul Marbrook published an essay today on Vox Populi: A Public Sphere for Politics and Poetry. The essay is called "The subversion of the Fourth Estate and the emergence of the Fifth Estate." In it, he cites The Gossips of Rivertown as an example of the emerging Fifth Estate. On Friday, the cause of historic preservation in the Hudson Valley lost a tireless champion and many Hudsonians lost a beloved friend, an esteemed colleague, and a valued mentor, when Mike Gladstone died. For decades, Mike was part of just about every effort to preserve and celebrate the character, history, and culture of the Hudson Valley. Mike was for many years the president of Hudson River Heritage. 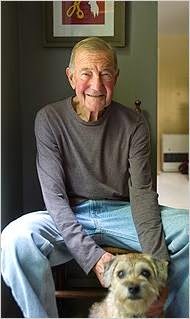 He was part of the Columbia County Historical Society, serving on the board and most recently working with Peter Stott on the publication of Looking for Work: The Industrial Archeology of Columbia County, New York. He was an advocate for the Hudson Opera House. 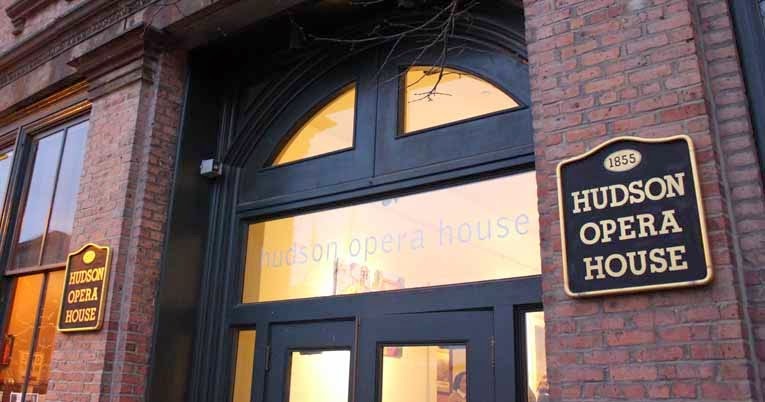 As a member of the HOH board in the early years, working mightily to revitalize a major historic building on Hudson's main street, Mike did all of the graphic design for the fledgling organization's many mailings and events. More recently, he designed the signs that flank the main entrance to the building. When it became known, in the late 1990s, that Columbia Memorial Hospital intended to demolish Cavell House to expand its parking lot, his was an eloquent and passionate voice for the grand house's preservation. He was an early advocate for the Dr. Oliver Bronson House, which he preferred to call the Plumb-Bronson House in recognition of its first owner and its original Federal design, and through the years was a valued and faithful adviser to Historic Hudson. Mike's life was long and rich, and the legacy of his work and influence will long enrich the lives of those who inhabit and cherish the Hudson Valley. Tonight's the Night . . . Which Chuck Do You Trust?